Build and hone your Spanish conversation skills by using this accelerated program will both challenge and amuse you as you actively converse with live educated native Spanish speakers. High Frequency Topics and Vocabulary - Only the most useful topics and vocabulary are used so that you gain a maximum conversational ability in a minimum of time. Educated and Degreed Native Spanish speakers from Colombia and Mexico - This effective team converses together so you get both educated Spanish accents at the same time and in the same program! I have been using Conversational Latin American Spanish by Mark Frobose for some time now and have nothing but praise for the program. 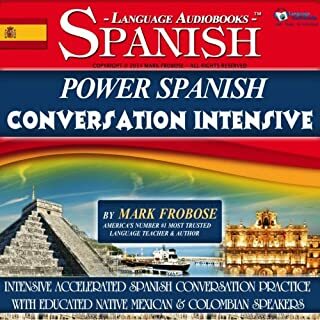 Power Spanish Conversation Intensive is also quite good, and has more material than one would expect for such a low price. Honestly, given the quality of Mark's programs and the low price, I don't see how anyone could go wrong. Have you priced a Rosetta Stone program lately? Designed for your next trip to Italy or simply to your favorite Italian restaurant, or for any Italian travel, eating or cooking experience, this program will teach you how to flourish in travel and restaurant situations. Learn to travel with ease in Italy, to order food, pay the bill, or leave a tip. Learn to ask for important menu items. Even learn to create your own original Italian sentences for basic conversation and much, much more! It is the best program I have ever heard in my life. The narration is so excellent. Good speakers make you converse in Italian within few hours. I love to travel and there can never be a beautiful place than Italy itself, but you need to be a good Italian speaker to explore the ethnic beauty of Italy. Before visiting Italy I decided to do a course in Italian speaking. 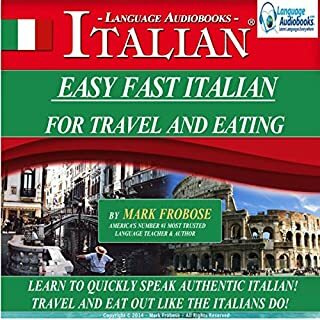 I tried various courses, but none was better than this audio book for easy Italian conversation, specially made for traveling and eating. All the Italian vocabulary needed to converse in Italy while traveling there and you can speak just like Italians when you visit in their restaurant to enjoy all your moments to the fullest while you are in Italy. There can nothing no program better than this audio book to learn speaking Italian so fast, worth the money. Even the speakers and narrator translates the Italian words meaning in English, which is very good and helps you to know when to use such words. I learned to speak a lot of Italian words like how to order food, pay the bill, I am hungry, ask for important menu items, basic conversation while traveling in Italy from this program. You can also learn to create your own original conversing sentences in Italian with this awesome program. Also, get its meaning in English before. Learn even much more that you can think of, with this handy audio book, which is so enjoyable too. Even it’s the best if you have a fondness for Italian food; speak just like Italians when you visit an Italian restaurant next time. This is the best program I have ever used. Try it. I'm sure it will work for you like it did for me. Where does Conversational Latin American Spanish - 8 One Hour Audio Lessons (English and Spanish Edition) rank among all the audiobooks you’ve listened to so far? 10 out of 10 for me. Easy to learn and get along with the Latin American speakers and the narrator, who does not go too fast, not too slow. You can easily converse with them in Spanish. Listen, learn, repeat, and review all in one. It’s just like you are directly conversing with the speakers sitting in front of you. It is a great program, the best I have ever used. The narration in this program is excellent! I will recommend this conversational Latin American Spanish program to everyone who wants to converse in Spanish, may be for a trip to a Spanish city or for shopping, restaurant, etc. It is the best program I have ever tried as you get to learn the real Spanish. The speakers also explain the meaning of it in English, which is very good. No guess work required and you learn with such an ease. Highly recommended! Before trying this awesome program, I tried various course books and audio programs but none was of any help to me. 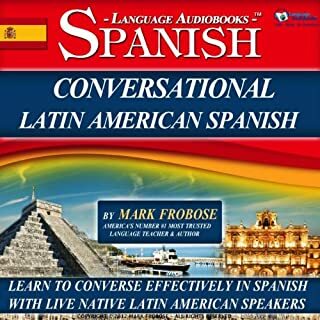 Then I tried this conversation Latin American Spanish audio book by Mark Frobose. I am compelled to say that it’s a great program, worth your money. It’s just like a live session with the Latin American Spanish speakers, with whom you conserve. They speak so slowly, again and again repeat it, and then little fast, ask did you get it, and then repeats it slow and fast. Mind retention power is used as the words are repeated again and again, thereby making your learning Spanish process so easy and spontaneous. I learned to speak a lot of vocabulary words related to shopping, restaurant, conversing with a Spanish person and when one travels to a Spanish city from this program. Real Spanish can be learned within few hours and one doesn’t even get bored of it, even by listening it again and again. Spanish learning gets so enjoyable with this program. Try it. I'm sure it will work for you like it did for me.